Grilled steak and fried eggs usually exist at opposite sides of the dining spectrum. One conjures images of plush rooms with well-heeled businessmen and women wooing clients with a martini in hand. 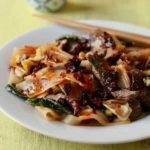 The other is an ingredient so ubiquitous you probably have some in the fridge right now. 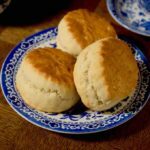 But combine the two, and you suddenly have something else: an obviously ridiculous feast, but one that doesn’t take itself too seriously. You might think that the dish is so simple no variation exists. But other countries understand the power of this duo, putting their own stamp on the dish. They even have fascinating names for it. In a number of countries, placing an egg on a piece of meat is referred to as “on horseback”, a wonderful slang phrase where the eggs “ride” the meat. In French, on horseback is à cheval. In Spain, there version is called bistec a caballo. 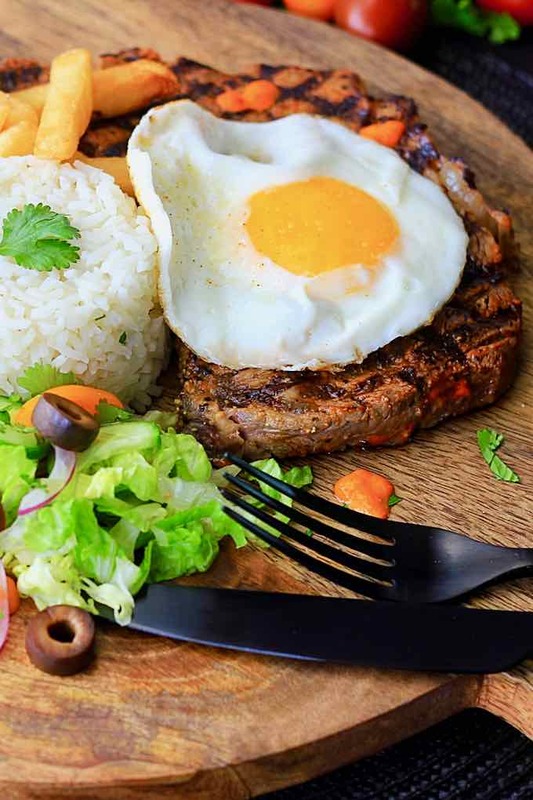 In Peru and Chile, steak and eggs is often referred to as bife a lo pobre, or poor man’s steak. If we travel to Portugal, we meet their version called bitoque. 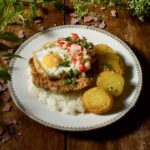 Bitoque is a traditional Portuguese dish, which consists of a lean fried or grilled steak or pork, that is usually accompanied by fries, rice, various salads and topped with an egg. 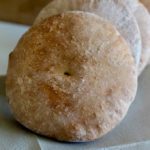 This recipe has its origin in Beira’s, Portugal. Its name comes from being cooked in wood burning ovens in the oil mills, while the olives were milled. Most commonly, it is enjoyed as the main course complemented with a tomato or a mustard sauce. 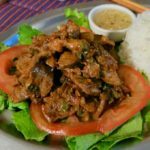 In the past, it was usually prepared with thin beef slices, but today pork varieties are equally popular. 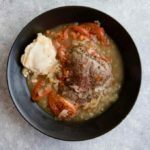 Bitoque is one of the most common lunch options for many Portuguese people and can be found on menus of many traditional restaurants across the country or even at malls and fast food restaurants at a mere cost of just around 5 Euros. 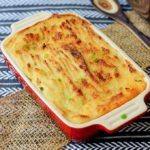 Bitoque (pronounced bee-tok) is such a traditional and easy to make dish. It is similar to the more common “Steak frites”, but with an egg on top. Portuguese steak is a preparation of a fairly thin cut of meat, most commonly fillet of rump steak. 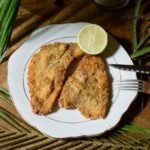 It is highly flavorful with a bit of spice, like massa de pimentão, which is primarily used as a marinade and it is an excellent way to flavor an economical cut of meat. Massa de pimentão is primarily used as a marinade for meat. It is made by removing the seeds from a red sweet pepper, adding a huge amount of salt to remove the water content. After allowing it to sit overnight, rinse off the salt, dry and roast it to remove the skin. Puree with a dash of olive oil and marinate your favorite steak in it. Extremely addictive with a smoky delicious flavor. To add a few more calories to this bitoque dish, an egg, sunny-side up, may be placed on top of the meat, in which case the dish acquires a new name, bife (com um ovo) a cavalo (steak with an egg on horseback). Bitoque demonstrates the idea that the meat only “touches” the grill twice, meaning that it does not grill for too long before being served, resulting in a rare to medium-rare cut of meat. Another variation of bife is bife a casa (house steak), which may resemble the bife a cavalo or may feature embellishments, such as asparagus. The Portuguese version of steak and eggs called bitoque con molho isn’t eaten for breakfast — which means you can serve French fries alongside it. The Portuguese love their starches and their eggs. Bitoque, also known as nail and prego are typical dishes of the Portuguese cuisine. Unfortunately, there is no concession with regard to these two dishes, which many claim to be exactly the same. The sandwich variety of bitoque goes under the name prego. 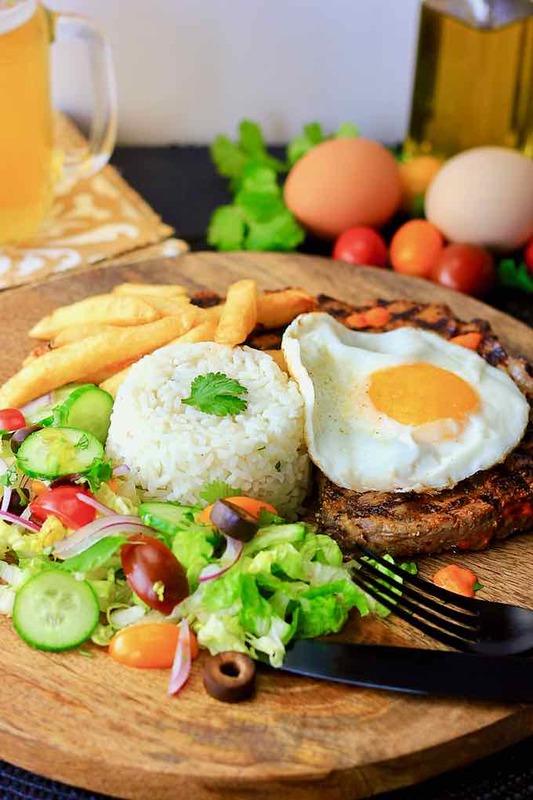 A prego consists of a small beef steak that is usually eaten in a sandwich, but there are those who like to eat it on the plate, with rice and French fries and often with eggs on horseback. When you choose to eat it in bread, it is very common, to be accompanied by a sauce. The sauces that usually season the prego are mustard or hot sauce. 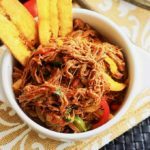 The description of “bitoque” is very similar being that, this version, is almost always eaten on a plate with potato chips/fries, rice and salad as accompaniments. The egg on horseback on the steak, is also very common. Both prego and bitoque can be accompanied by ham and cheese. These two ingredients can be placed between the steak and the egg. Nail is often seen as a tasty and quick snack to make. 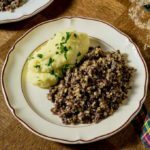 In turn, the bitoque is considered a meal, a dish that is a bit more time consuming and elaborate but very tasty as well. The “prego” and “bitoque” steak can be fried or grilled and the meat can be beef or pork. However, the pork version is very recent and is usually only used for the bitoque and is not so usual for prego. 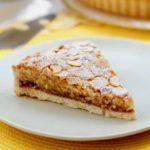 Some people argue that the name given to these dishes has a lot to do with the site or region where they are requested. This means that, depending on where you are in the country, the name may change. We refer then to different regionalisms regarding the Portuguese language. 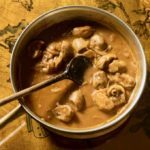 Therefore, in the northern part of the country, the most common is to ask for a nail in the dish, but if it goes down to the central and southern areas of Portugal, the word bitoque will be the most used. 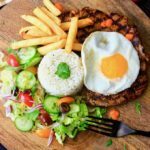 Enjoy this hearty dish of steak, eggs, rice, fries and a fresh accompaniment of salad the next time you have a full day of heavy lifting as this bitoque is made to stand up to a farmer’s strength who has to be out in the fields all day. 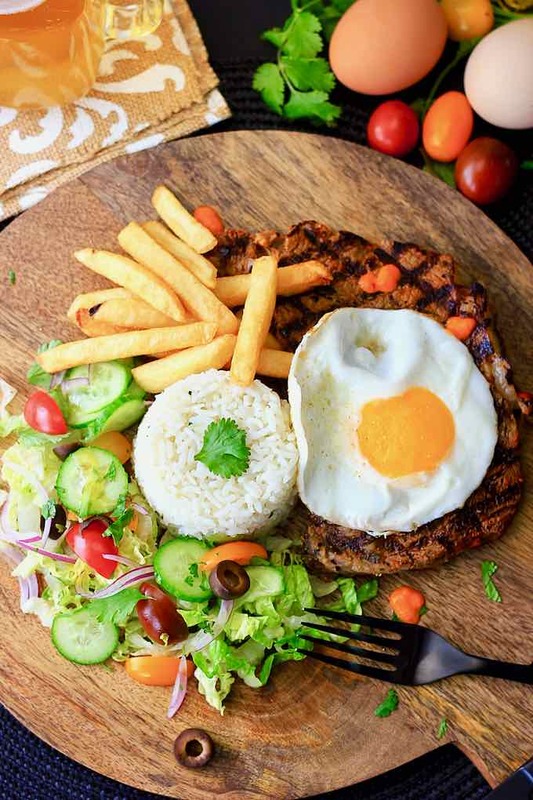 Bitoque is a traditional Portuguese dish, which consists of a lean fried or grilled steak or pork, that is usually accompanied by fries, rice, various salads and topped with an egg. Peel the potatoes and wash them, then cut them into thin or thick sticks (according to taste). Wash them again and dry them thoroughly in a clean cloth. In a large saucepan or a fryer, heat a large volume of oil to 300 F.
Fry the potatoes the first time for 7 to 8 minutes. Do not overload the pan or deep fryer. For 2 lb of potatoes, fry about ⅓ of the French fries at a time. Let the French fries cool, while preparing the meat and/or the rest of the recipe. Fry the French fries a second time in oil heated at 375 F for about 3 minutes (they must be crisp and not hard). Season with salt. In a Dutch oven, sauté the onion and garlic in olive oil for 3 minutes over medium heat. Add the rice and black pepper. Mix well and sauté for a couple minutes, stirring occasionally. Add the boiling water and season with salt. Cover and cook on low heat for about 15 minutes, or until rice has absorbed all the liquid. Cut the lettuce leaves into pieces. Mix the salad and all the other ingredients. Season the steaks with salt, pepper and massa de pimento. Marinate for 30 minutes. Brown the steaks in olive oil, turning occasionally until meat is cooked. Add the butter and pour the white wine. Reduce the sauce and keep warm. Heat a little olive oil in a skillet over medium-high heat. Break the eggs in the hot oil. Cook until desired doneness. Season with salt and pepper. Place a steak in each dish and top each steak with an egg. Garnish each dish with a little rice, French fries and salad. Fry the French fries for the second time during the preparation of the meat and eggs so that everything is hot when serving.